Pretreatment of lignocellulosic biomass remains a bottleneck for the production of second-generation bioethanol. Conventional pretreatments have had moderated success in meeting the criteria to be considered cost and energy efficient; however, ionic liquids have shown promising results. 1-ethyl-3-methylimidazolium acetate is one of the most successful ionic liquids used for biomass dissolution. The physical and chemical changes of ionic liquid pretreated lignocellulosic materials must be thoroughly studied to maximize the benefits of this technology. 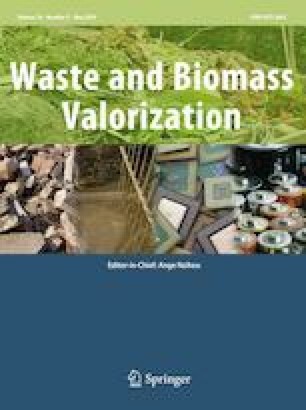 Agave tequilana bagasse (a major source of residual lignocellulosic biomass in Mexico) was pretreated using ionic liquid at four different temperatures: 40, 80, 120 and 160 °C. Untreated and pretreated samples were chemically characterized, and their physical properties were studied using X-ray diffraction, thermogravimetric analysis, attenuated total reflection Fourier-transform infrared spectroscopy, scanning electron microscopy, and surface area analysis using a BET model. Positive effects in the physical characteristics of the bagasse were obtained: an increase in surface area, decrease in cellulose crystallinity, and lignin content were observed at temperatures up to 120 °C. Higher temperatures were detrimental for these characteristics. The authors would like to thank the Consejo Nacional de Ciencia y Tecnología (CONACyT) for the Scholarship No. 389217 granted to Mintzirani Equihua-Sánchez. The authors gratefully acknowledge Tanit Toledano-Thompson for the SEM images acquisition and M.Sc. Jorge Arturo Domínguez-Maldonado for FTIR spectroscopy data acquisition.